Note that n, h, d, u ∈ ℕ where h represents hundreds, t represents tens, and u to represents units . Unless otherwise specified, the expression canonical form refers always to the first form. By definition, an number n can be written as n = 2 p n, p ∈ ℕ note that n is , but we have no information about p that can be or . By definition, an number n can be written as n = 2 p + 1 n, p ∈ ℕ note that n is , but we have no information about p that can be or . So, the production of two natural numbers is only when both of them are . In this part, as all numbers are , I will apply division by 2 . When applying Collatz sequence to an number, produced result will fork on two different digits depending of the parity of t . Note, the special case of 0 , that is the only case with self loop. As we divide, by 2 , the result is strictly less than the input. In this part, as all numbers are , I will apply apply by 3 υn + 1. When applying Collatz sequence to an number, produced result will always be an number. This implies that when applying Collatz sequence, we will never apply twice in a run the Collatz sequence rule. Let’s focus now on suite analysis, has this will bring many insights on the Collatz Sequence results. By convention, the indice n starts at 1. 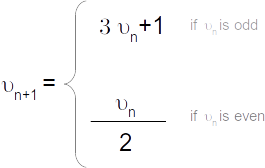 We need a formulae that provides the nth result, directly from the input. For numbers, it is quite obvious, as ηk = η1 / 2k with k being the number of times we apply the transformation, will provide the result. σk = Σ i = 1k 3i - 1 . As ηk starts forcibly with η1 being , the recurring process of division by 2 repeats while ηk is and stops immediately when not. In the worst case, we execute a single division by 2. As this suite is composed of the sum of 2 suites, we will use the addition parity table. As φk starts forcibly with φ1 being , the recurring process of multiplication by 3k that is always too, brings always an result. CURIOSITY: Seems that each forth numbers are multiple of 10. Sum of this four ending digits turns to be 20 . So the parity of suite σn follows a pattern that is and then , and repeat this sequence. More precisely, we have parity( φ2 n + 1 ) = parity( φ1 ) and parity( φ2 n ) = ¬ (parity( φ1 )). Therefore, the suite ωn that is the addition of 2 suites, φn that is always and σn that is an alternate parity suite starting with an value. In short, ωn has the same parity as σn . The canonical forms used on paragraphs 2.1 and 2.2, covers individually all the numbers that end with a digit from to . They form a partition of ℕ. This partition is fully covering ℕ as each number ends by one of the 10 digits. One way to understand the digit mutation tables, is to consider the canonical form as a generative suite of the input number, and applying η or ω will create a generative suite of the output number that will end with a predicted digit.